DARMSTADT, Germany - Europe?sCryosat-2 polar-ice-monitoring Earth observation satellite successfullylaunched into space Thursday aboard a Russian-Ukrainian Dnepr rocket and is expected toundergo a six-month checkout period before starting three years of radar observationsthis fall. Operating from Russia?s BaikonurCosmodrome in Kazakhstan, the Dnepr silo-launched rocket ? a converted SS-18ballistic missile marketed by Kosmotras of Moscow ? placed the 1,587-pound(720-kg) Cryosat-2satellite into a 447-mile (720-km) near-polar orbit inclined at 92 degreesrelative to the equator. A European Space Agency (ESA) groundtracking station in Malindi, Kenya, confirmed the satellite?ssuccessful separation from the rocket and initial in-orbit health. 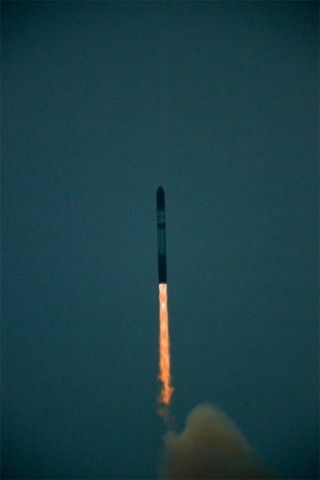 The launch, which camefour-and-one-half years after the originalCryosat satellite was destroyed in a launch failure of a Russian Rockotvehicle, followed months of delays related to the availability of Dnepr. The launch had also been delayedbecause of a last-minute concern that Dnepr would not be able to carryCryosat-2 to the intended altitude of 720 kilometers. That issue was resolvedwhen Dnepr designers modified the fuel to the vehicle?s second-stage steeringengines to permit the 720-kilometer orbit. It was not only Cryosat-2?sweight that pushed Dnepr to its performance limit. At 4.6 meters in length,Cryosat-2 required Dnepr?s extended fairing, which meant that the rocket?sunderground silo was left uncovered leading up to launch. Taking account of the expense ofthe first satellite, the Cryosat mission will have cost the 18-member ESA about254 million euros, or $339.4 million at current exchange rates. That figureincludes 145 million for Cryosat-1 and 109 million euros needed to buildCryosat-2. The budget also includes three years of in-orbit operations. Astrium Satellites ofFriedrichshafen, Germany, built Cryosat-2 under a contract valued at 75 millioneuros. While the mission is currently scheduled to last for three yearsfollowing the six-month checkout, the satellite?s fuel, batteries and otherconsumables are sufficient to last for at least five years, said EckardSettelmeyer, director of Earth observation at Astrium Satellites. Cryosat-2 is not an exactduplicate of the original Cryosat. Unlike the first version, Cryosat-2 featuresa backup Siral radar instrument, to be used in the event of a failure of theprimary Siral, or SAR Interferometric Radar Altimeter. Thales Alenia Space of France andItaly built Siral, which follows on a series of satellite radar altimetersincluding those flying on the U.S.-French Jason ocean-observing satellites. ESA Earth Observation DirectorVolker Liebig said Crysat-2?s ability to measure, with centimeter-levelaccuracy, the polarice caps is of obvious environmental importance given that the caps containan estimated 77 percent of Earth?s fresh water resources. Some 10 percent of Earth?sland surface is permanently covered by ice, and one of Cryosat-2?s missions isto furnish data permitting better estimates of global warming and associatedrises in sea levels. But in a presentation made justbefore the launch, Liebig said that as the Arctic regions become more navigablewith the reduction of ice coverage, the regions have a geopolitical interest aswell for their suspected reserves of oil and gas.